Systematic Investment Planning (SIP) is by far the best way to invest in mutual funds... especially equity mutual funds. However, many investors often get confused when it comes to calculating how much they have actually earned from their SIP investment. 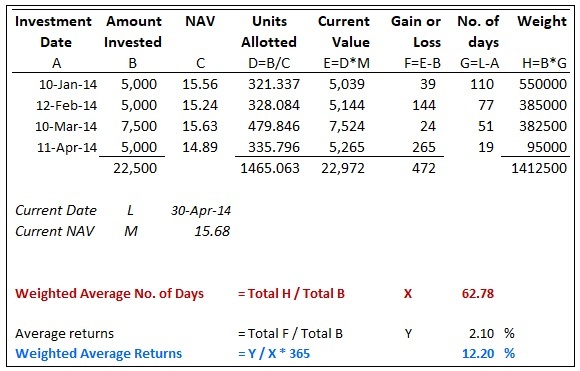 Simply dividing the total gains by the total investment is incorrect. It does not account for the different no. of days that each SIP amount has been invested for. However, using excel sheet and a very simple strategy — known as Weighted Average Method — you can calculate the exact returns of your SIPs in just a matter of minutes. A self-explanatory example of the same is given below. In fact, this weighted average methodology can be applied not only to your SIPs, but also to other such irregular investments. By the way, there is still simpler option to calculate returns of a scheme for investments made on different dates. This is the XIRR formula in Excel. XIRR is quite similar to calculating IRR. All you have to do is to also include the dates into the formula. This is explained in detail in my blog Learn How to Calculate TRUE investment returns or TRUE loan cost.